To help with mounting or installing your security devices we have the Rooftop and Surface Mounted Poles. They are made of the same special Aerospace Aluminum our 4″ Classic Camera Poles are made of but come in a shorter length15inch and 30inch because sometimes a five-foot, eight-foot, or twelve-foot pole is too tall for your project. This mount can be mounted upside down under building eaves, sideways from building faces or even bridges to provide multiple fronts for mounting cameras, sensors, or antennas. We have had a customer use this system with a Fly-Out mount on a flat roof to hang a PTZ camera over a parapet wall. Another customer used the system with the 8×10 mounting platform off the side of a building to install two bullet cameras and a PTZ. 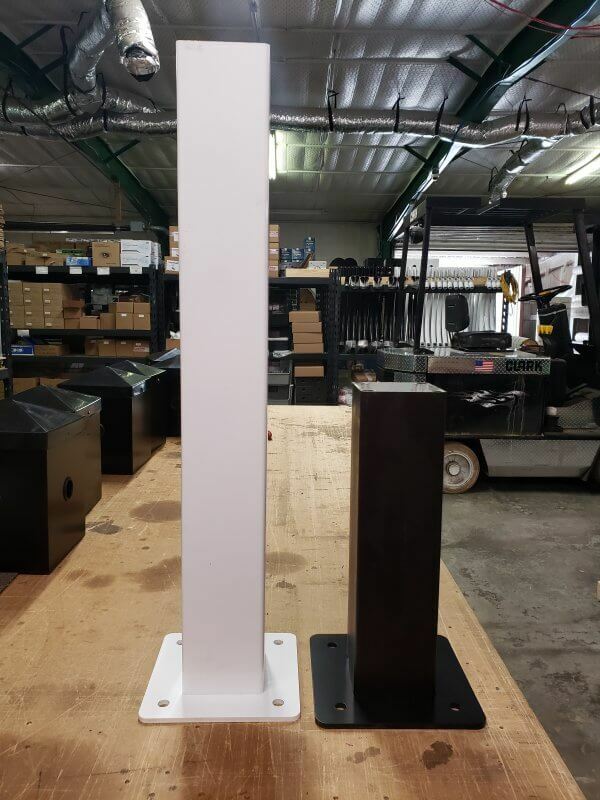 The two standard pole heights for this system are 15” and 30” tall (not counting the 1/4″ thick aluminum base). The base measures 8” x 8” square, and has 1/2” holes for anchors, lag bolts or other mounting hardware (not provided). Also a 3″ opening to allow conduit, cables, fiber optic, etc. to pass through the base. The cap on the top of the short pole may be removed for mounting an attachment or can be accessed for using the pole as a junction box. Holes for conduit fittings may be drilled anywhere needed easily. This Mounting System can be used with any of the 4″ Classic Camera Poles attachments to create a truly custom mounting system for any purpose. Cameras, lighting, sensors, or other devices can easily and quickly be mounted on any or all of the four mounting faces, or any mount may be used. The combinations go much farther than what we have talked about. Use your imagination and mount what you need for your project. For more information on our Rooftop and Surface Mounting Poles please stop by our website or call one of our Sales Engineers here at StrongPoles toll-free 844-669-3537. This entry was posted in Blog and tagged Universal Surface Mounting System.